Loosely based on Dostojevskij's novella, the Italian director of passion tells of Natalia's yearning. She is a young Russian living in Italy, who for one year has been waiting for her far away lover who had been a lodger in her half-blind grandmother's house. On the agreed day of the meeting she waits in vain. 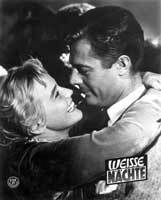 In the course of this, she is being observed by another man, bachelor Mario (Marcello Mastroianni), who introduces himself to her and comforts her (Maria Schell, in demand as a Russian type in the Fifties, could enact her talent for emotional outbursts to the maximum here). At first she wants to employ Mario as a "Postillon d'Amour" but he tears the letter to the overdue lover because he falls in love with Natalia. But at the end, in the last of the "white nights", Jean Marais, the lover believed to be lost, appears like a black angel. Visconti has already moved away from neo-realism here.